Location: Our outstanding vacation rental villa is located in the new gated, mediterranean style resort of Tuscan Hills. Landscaped with mature palms and trees, the ambience is one reminiscent of the quiet Italian countryside. All of this and only 15 minutes away from Walt Disney World and offering easy access to the many attractions Florida has to offer. Accommodation: An outstanding new executive style vacation home furnished to an extremely high standard and offering spacious accommodation over 2 floors. Sleeping up to 11 guests plus an infant. Your family will adore the Tuscan style decor and the many amenities on offer to our guests. Need to keep in touch with your office? Then just bring along your laptop computer, wireless internet connection is free. The Pool: Sliding glass doors lead to the external patio area. Featuring a wonderful recessed lanai with ceiling fan and overhead lighting, this is the perfect vacation rental place to enjoy alfresco eating. Outdoor dining furniture and comfortable reclining seats provide the perfect environment in which to view the Florida sunsets, or to simply relax in the Florida sunshine. You can "chill out" while your small children play in the shallow spa. The pool and spa also benefit from underwater, multi-coloured lights. 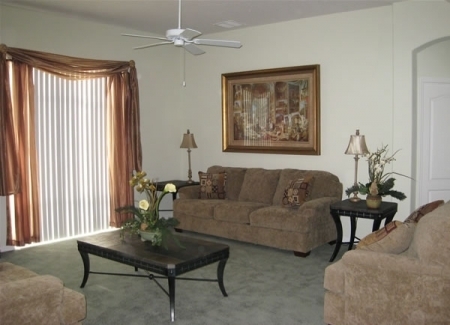 Family Room: The fabulous family room is the hub of the vacation home. Decorated in subtle shades of green, and featuring wonderfully comfortable seating. Your family and friends can "recharge their batteries" and prepare for the next day's activities, while taking in a film from the available DVD collection. Dining Room: The dining area offers formal seating for eight guests. The kitchen is equipped with everything you need to prepare your family meals. So unwind over a relaxing meal and take in the wonderful atmosphere of your Tuscan style surroundings. Kitchen: The kitchen is fitted with every modern appliance, including microwave oven, electric oven with hob, dishwasher, waste disposal unit, coffee machine and fridge freezer with ice dispenser. 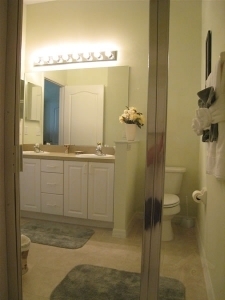 A washer, dryer, iron and ironing board are located in a separate utility area. 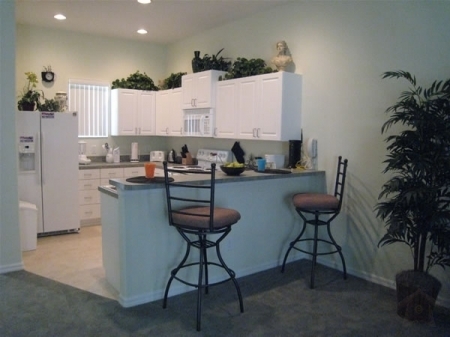 This bright and spacious kitchen also has a breakfast bar with bar stools. 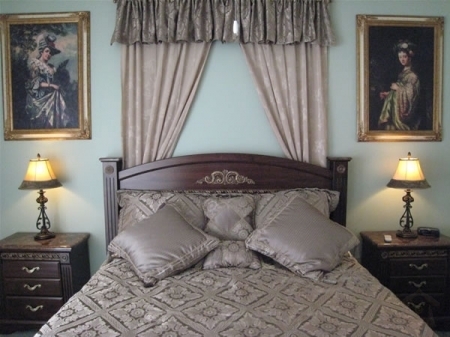 Regal Master Suite: Situated on the lower floor, this large suite has been decorated in a truly "regal" style. The king-sized bed is dressed in rich green fabrics. Overhead matching drapes complete the opulent effect. The walls bear large portrait paintings, reminiscent of our Georgian ancestry. 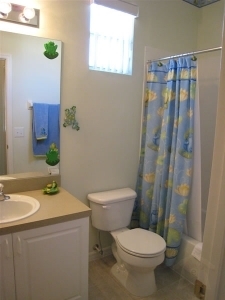 The en suite bathroom is accessorised in matching green and has a family sized bathtub, walk-in shower and washbasin. 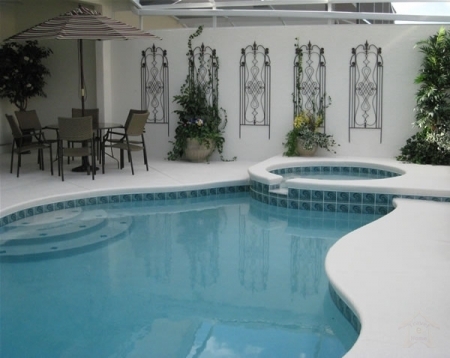 Patio doors lead from this suite to the outdoor pool area. 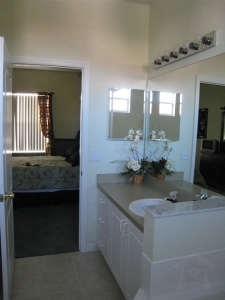 Oriental Master Suite: The second master suite is on the upper floor. How surprising to find a room decorated with more than a hint of the Orient, in the heart of Florida. 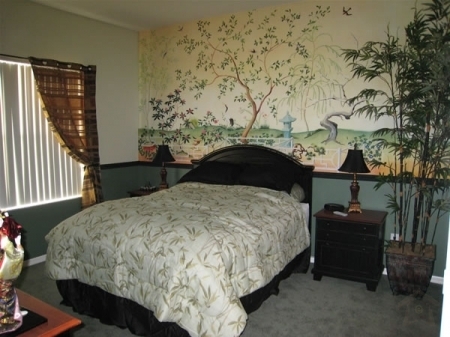 The queen-sized bed is overshadowed by the extensive Japanese "Oriental Garden" wall mural. Shades of green and contrasting black complete the dramatic effect. Bamboo plants and oriental style accessories have been used to great effect. The en suite bathroom, also accessorised with black, has a family sized bathtub and a walk-in shower. 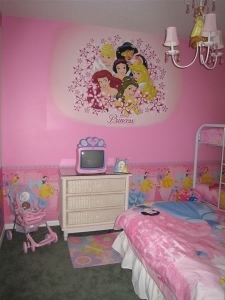 Disney Princess Room: A fabulously spacious room with bunk beds as well as a twin bed. Your little girls can enjoy their dream of "living like a princess". The walls are decorated with Disney Princess wall murals, as are all the accessories in the room, including television, chandelier, lamps and clock. We even provide toys, and can you believe it, they too are Disney Princess. Bedtimes will never be a problem! Mickey Mouse Room: Children cannot fail to be amazed by this fabulous room. With colourful decor and images of "Mickey and Friends" covering the walls. 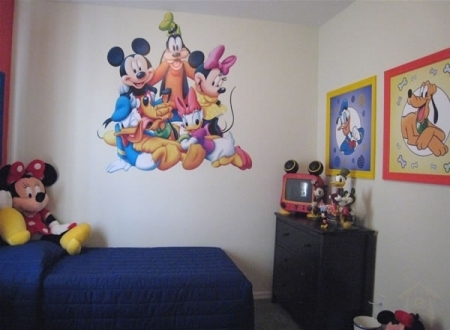 The twin bedded room features a Mickey Mouse television as well as a Playstation2 (with games). The closet holds further surprises, a box of toys suitable for all small children. 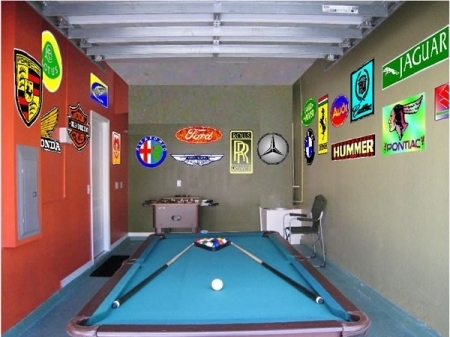 Car Mascot Games Room: With a large pool table and foozeball game, children and adults alike will love to spend time in this games room. The walls are decorated with emblems of famous cars. Pets are not allowed and smoking is permitted only outside in the pool area. We provide linen, towels and hairdryers. Local telephone calls are free as is access to wireless internet, just bring along your laptop computer. We have provided a selection of DVD films, a small selection of books and a quantity of games. While staying at our villa, should you have any queries, our local management company is only a free telephone call away.